The new Honda Wave110i is now available in Honda dealers, for all those looking for low-cost, straight-forward and hassle-free motoring. The Wave110i offers superb fuel efficiency and a total tank range of over 130 miles between fill ups. Low fuel costs are coupled with low running and maintenance costs, creating an attractive proposition for the everyday commuter. 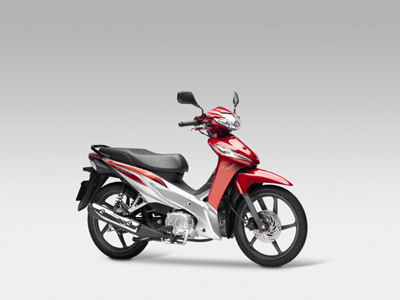 Delivering smooth power from its fuel-injected single-cylinder 109cc four-stroke engine, via a four-speed transmission, the strong, user-friendly engine is mounted in a tough and compact frame with chassis geometry that delivers a light and quick manoeuvrable bike, ideal for city use and daily commuting. Priced at just £1,800 OTR, the Wave110i becomes even more attractive to those looking for cheap, reliable and uncomplicated transport. It is also available on finance, from as little as £50 per month*. For further details on the Wave110i and for more information on Honda’s range of fuel efficient motorcycles and scooters, visit your local Honda Motorcycle dealer, visit honda.co.uk.